Ever wonder what this gnarled looking mess is, in the bins on the green’s wall in your supermarket? 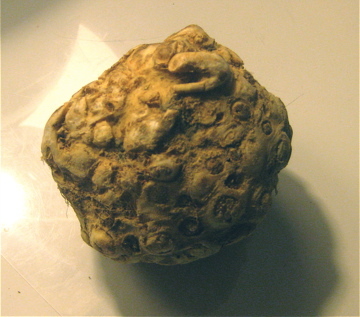 It is celeriac (or celery root), a kind of celery that is grown as a root vegetable. It has the same fresh, grassy taste as celery, but a parsnip-like texture. Despite its awkward appearance it’s easy to prepare- all you need is a vegetable peeler. It has a mild flavor that is often used to complement soups, gratins, or – if you are looking for something to eat with your leftover short ribs – mashed potatoes. 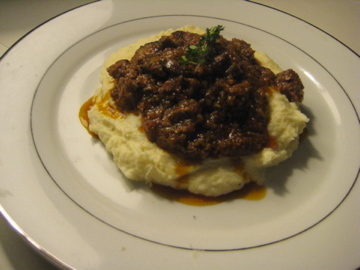 Adapted from a Saveur recipe, here is a nice alternative to regular mashed potatoes. The celeriac gives them a fresher taste, but don’t worry, the finished product is still quite hearty. 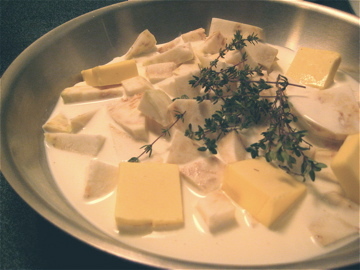 Peel the celeriac with a vegetable peeler (no need to buy a “celery root peeler,” if such a thing exists), cut into 1/2 inch cubes and place into medium sauce pan with half and half, butter, and thyme. Bring to a boil, then lower heat and simmer for 25 minutes, partially covered. While this is simmering, peel and cut potatoes, add to a pot of water. Salt your water, bring to a boil, then simmer until potatoes are tender- about 10-15 minutes. If you time this correctly, the potatoes and the celeriac should be done within minutes of one another. Remove thyme stems and puree celeriac mixture in a food processor, add back to sauce pan and keep warm. 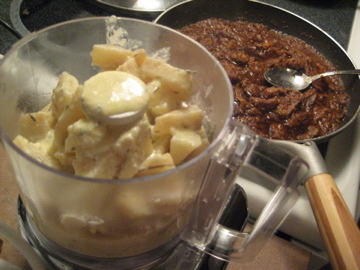 Drain potatoes and whip, adding 1 tbsp butter and 1 tbsp half and half as you whip. 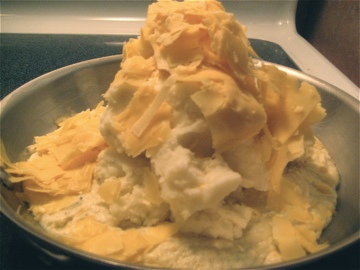 Transfer potatoes to pan with celeriac puree and whisk in cheese until melted. Season with salt and pepper. Pile on plate. Spoon leftover short ribs over potatoes.